Every year, Lakhs of candidates prepares for SSC CGL exam but very few of them are able to reach to the level of getting a job. There are many reasons behind this including lack of preparation. 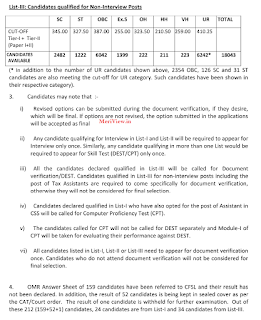 It is very important for a candidate who want to qualify SSC CGL exam that he/she should know what is the cut off score to achieve to get a better post. So to help those candidates, here is a collection of SSC CGL CUT OFF SCORE of Last years including 2016, 2015, 2014, 2013 Re-exam, 2012 & Current year 2017. For those candidates who want to qualify SSC CGL exam should know what are the cut off scores they have to clear. Those candidates who are preparing for SSC Common Graduate Level CGL exam should know what will be the minimum scores they have to get in SSC CGL exam to qualify the exam. Here are the actual cut off marks of CGL 2017 Tier 1. 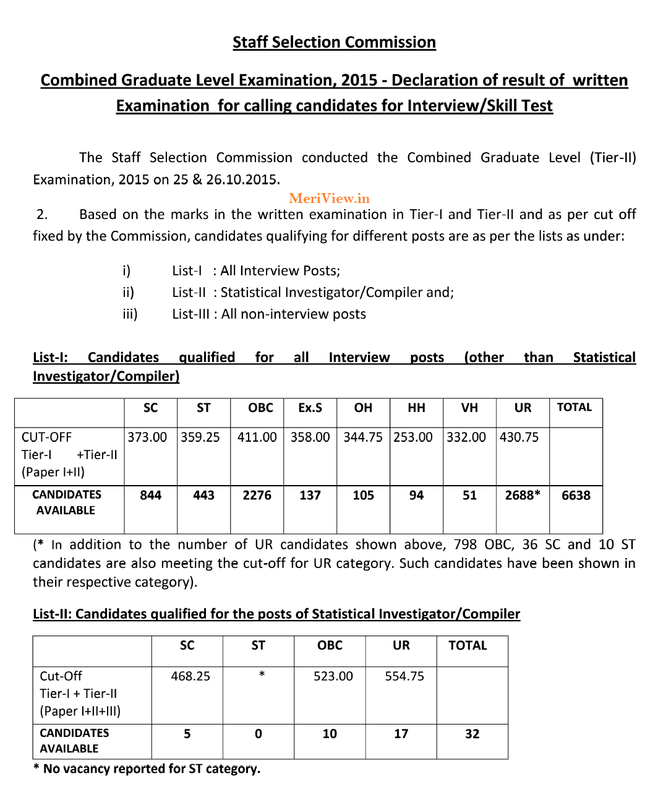 SSC had released the final result of CGL 2016 along with final cut off for all posts. Here are the cut off marks of SSC CGL 2016 online Tier 1 exam. 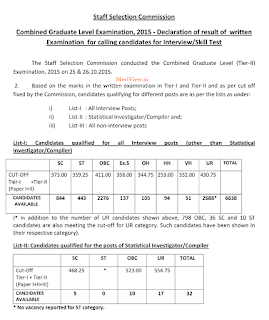 Here are the final write up / cut off released by SSC for interview and non interview posts. Here are the official cut off marks. 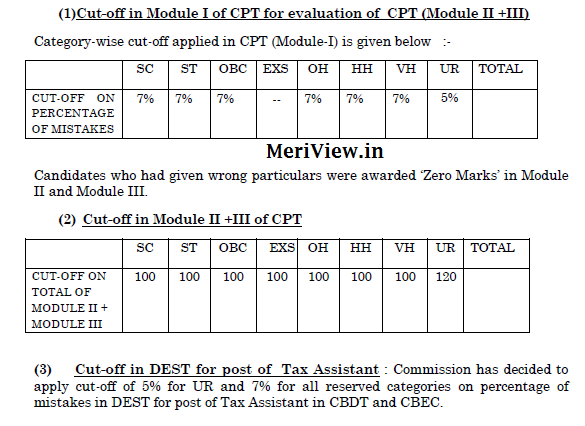 Official cut off marks of Tier 2 CGL 2014 are given below. 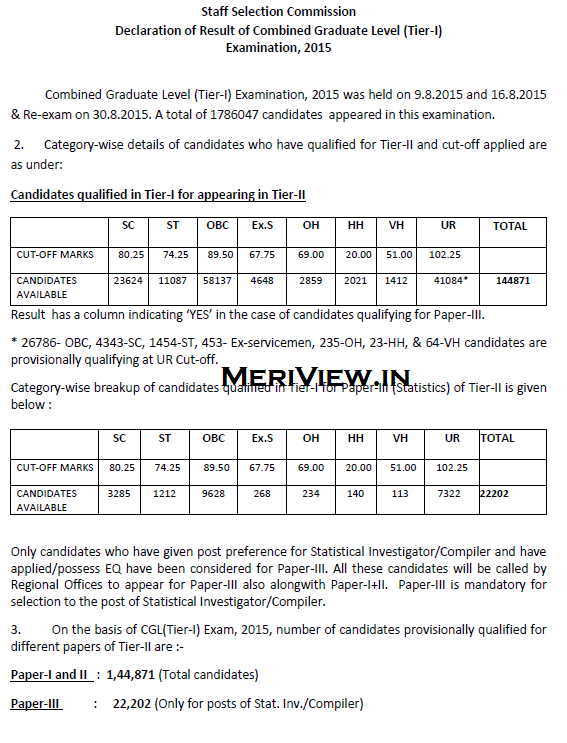 Here are the cut off marks of SSC CGL 2015 Tier 1. Combined Graduate Level (Tier-I) Examination, 2015 was held on 9.8.2015 and 16.8.2015 & Re-exam on 30.8.2015. A total of 1786047 candidates appeared in this examination. Check Cut off from below given image. 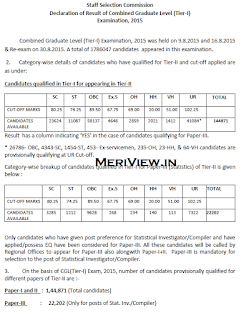 Here are the cut off marks of SSC CGL 2014 Tier 3. The cut off scores of CGL 2014 are nearly same as what we had expected. Here are the official cut off marks of Tier 2. In addition to the number of UR candidates shown above, 1386 OBC, 113 SC and 36 ST candidates are also meeting the cut-off for UR category. Such candidates have been shown in their respective category. In addition to the number of UR candidates shown above, 104 OBC, 7 SC and 2 ST candidates are also meeting the cut-off for UR category. Such candidates have been shown in their respective category. * In addition to the number of UR candidates shown above, 4417 OBC, 509 SC and 151 ST candidates are also meeting the cut-off for UR category. Such candidates have been shown in their respective category). There are 501 candidates common between List I and List II and 911 candidates common between List II and List III. Check out the image for more details. 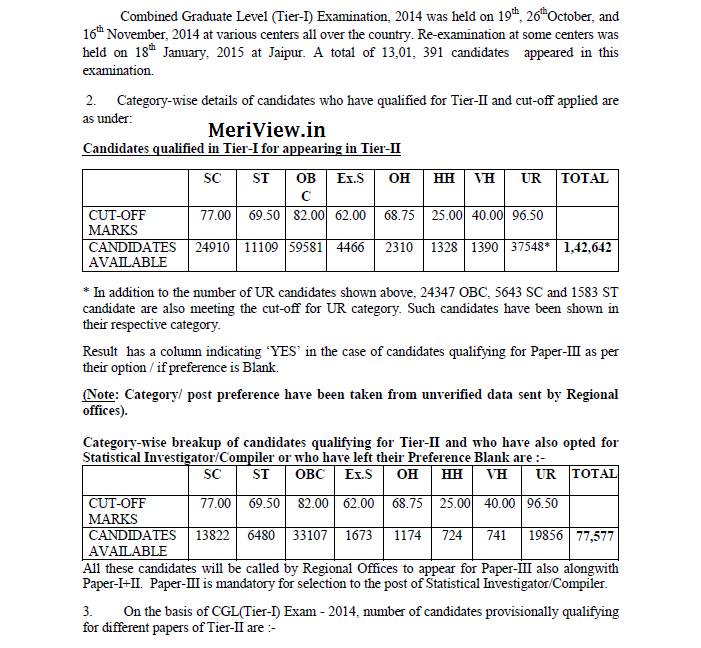 1301391 candidates had appeared for SSC CGL 2014 Tier 1 exam. Download Cut off Pdf officially released by SSC. For better preparation of SSC CGL Exam, your first step should be having the following item. SSC had announced the final cut off for selection in CGL 2013. Check out the below given image and link. As far as the 2013 Re-exam cut-off is concerned, here is the official cut-off. Those candidates who have also opted for tax assistants, their cut-off is at relaxed standards. The below marks are out of 200. 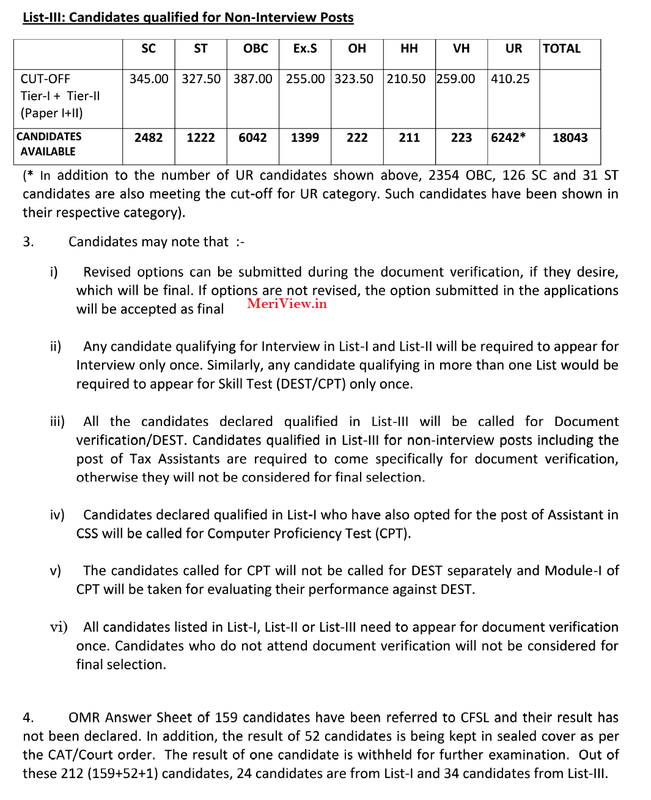 Total 1212429 candidates appeared in SSC CGL 2013 Tier 1 exam and 131348 candidates are able to qualify it. Cut off of statistical investigator/compiler and tax assistant posts is nearly 1-4 marks less than the above. analysis. The below given marks are out of 200. The above cut off does not involve cut off of statistical investigator/compiler and tax assistant posts. Their cut off is nearly 1-2 marks less than the above. Total 967474 candidates appeared in this exam and 121307 are able to qualify it.